So after 33 years, Morris wrote in the note, he was considering closing down the shop. The bakery that in the 1970s helped ignite the Bay Area artisan bread trend is now in danger of becoming a victim of its own success. When the Bread Garden opened in 1976 across the street from the Claremont Resort on the border between South Berkeley and North Oakland, it was one of the first bakeries in the region to offer a certain kind of fresh-baked bread: french baguettes, morning buns, and the three-seed sourdough ryes. According to Morris, there were only three bakeries within a two-mile radius of his store. As independent bakery bread grew in popularity during the 1980s and 90s, the bakery stayed small – producing approximately 300 to 500 loaves and pastries a day – and becoming a neighborhood institution. 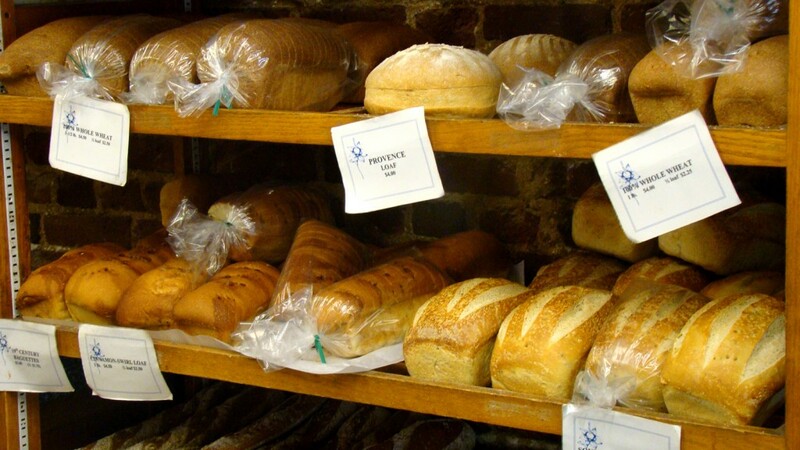 Yet today the Bread Garden competes with nine other bakeries in the same two-mile radius. Bakeries and farmer’s markets further south and west offer fresh bread bread and ACME Bread Company and Semifreddi’s Bakery distribute their products in stores and supermarkets throughout the region. The increased competition has cut into Bread Garden’s sales. Morris’ letter implored its readers to “Help us get more customers in the door. Buy your pastry here rather than at Peet’s, and your bread here rather than at the supermarket.” Morris says that if he finishes a second year in the red, he may allow his lease to expire at the end of 2009. Bread Garden’s quaint storefront sits at the end of small, tree lined shopping center. Traffic on a recent Sunday morning was intermittent but steady, with none of the long customer lines visible next door at Peet’s Coffee. Photographs of Morris’ recent trip to Prague adorn the walls and baked animal shapes are featured above the bread racks. Every morning at 8 am, Pedal Express, a bicycle delivery service, arrives to pick up seventy or eighty loaves for the Berkeley Bowl market on Shattuck Avenue, the only other location in Berkeley where customers can buy Bread Garden products. Customers have urged the Bread Garden to adapt, offering their suggestions for new product lines and restaurant partnerships and urging Morris to establish a presence at farmer’s markets throughout the East Bay. Standing outside the Bread Garden with three freshly purchased french baguettes in his hand, customer Joe Halperin agreed that there is a plentiful supply of quality bread and baked goods in Berkeley but argues that successful shops must meet the needs of their customers. “Go out and get a sense of what the community wants,” he said. Morris said his business has seen a five to ten percent increase in sales over the last two months and that people are talking about his possible move. Yet long-time customers Kay and Takako, who declined to give their last names, were surprised to hear the news. The mother and daughter said they suspected customers like them had been studying the pastries, not the signage. “They should say something,” Kay said. “Maybe ‘Thanks for coming and did you see our sign?’” she suggested. Meanwhile, Semifreddi’s is in its own process of relocation. In October, the family-owned company’s central baking facility in Emeryville will reopen in a larger, 36,000 square foot facility on Alameda Island, near the Oakland Airport. With accounts stretching up to Novato and down to San Jose – brand exposure for future growth, Frainier said – Semifreddi’s needs the space and intends to use it. There is a missing word at the end of the first sentence of the third paragraph…what kind of bread did the Bread Garden uniquely offer? I want to know! Please correct. Otherwise: I live near Lake Merritt and had never heard of the Bread Garden. Come on down if you move! Especially if you could add some hearty whole wheat loaves to the repertoire. We have lots of great white poofy breads in the East Bay but nothing that sticks to your ribs. Think Germany. Bread you have to slice really thin. But not that square stuff, just a good basic fully whole wheat or rye would be phenomenal. I’m all for not expanding more than you want to and hope that the Bread Garden can stick it out!! thanks for the tip! the missing breads in question have been updated. I live in the country next to a lake in British Columbia, Canada. The nearest city is Kamloops which is 1&1/2 hour away by car. The best muffin I have ever tasted is the blueberry oatmeal that I had at the Bread Garden at the Kamloops airport. Please could you e-mail the recipe? I think it was a oatmeal berry one.